“Royal Standard” was a trademark used on English china made by a potteries company called Chapmans Longton Ltd. This company was among the famous Staffordshire pottery companies, and based at Albert Works, Longton, Stoke-on-Trent. Longton was a center of pottery making from the mid-1700s. White and blue China bowl. Chapmans Longton Ltd., had three known manufacturers’ trademarks. “Standard China” was one of them, used between around 1916 and 1930. 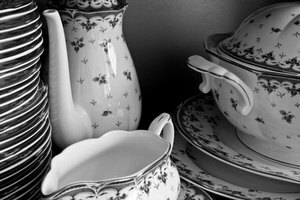 “Royal Mayfair” was another trademark, used to identify the company’s bone china during the period from about 1938 to 1941. “Royal Standard” was perhaps the company’s best known trademark, in use from about 1949. 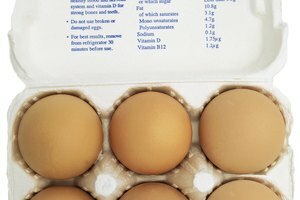 Dates of trademark use are not always exact though. Chapmans Longton Ltd., is not related to another Longton firm by the name of David Chapman & Sons. David Chapman & Sons subsequently became Chapman & Sons (Stoke-on-Trent) Ltd. The firm underwent a further name change to Atlas China Co., Ltd., at a later date. Looking at paintings in museum. According to some records, David Chapman & Sons was in business at Longton between 1882 and 1902, and “Chapman China” operated in Longton between approximately 1898 and 1905. However, these records may be incomplete as to dates of operation. The photo of a Staffordshire china interior with a female potter at work and two onlookers, could be of either company. The second photograph is a group picture of female pottery workers standing outside a glost kiln. Unconfirmed is which Chapman company they represent. “Rosamund” was a special design created by the artist, F.F. Errill (subsequently a designer for Royal Albert). A cup and saucer set signed by the artist and bearing the Royal Standard trademark, dates back to the period between 1946 and the early 1950s. The cup features pink blossoms and gold trim and in a corset pedestal shape with an ornate handle. The cup has a pale pink interior and is about 3 inches tall and the saucer is about 5.75 inches in diameter. A Chapman cup and saucer commemorating the Jubilee of Queen Victoria in 1897, is now part of the Lennard Collection in the Powerhouse Museum in Sydney, Australia. 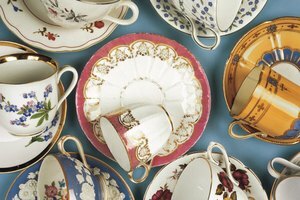 Chapman Longton Ltd., produced elegant Royal Standard commemorative works of art and other bone china items between 1916 and 1969. Among the patterns produced was “Scots Emblem” which incorporated purple thistles, in keeping with Scotland’s floral emblem. 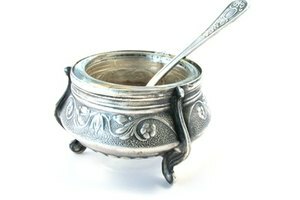 A particular feature of the design was that the thistle pattern appeared inside the cup as well as outside. According to the item description at Rubylane.com, Royal Doulton absorbed Chapman Longton Ltd., after 1969. Time Was Antiques: Royal Standard "Rosamund"
Katemopoulos, Maureen. 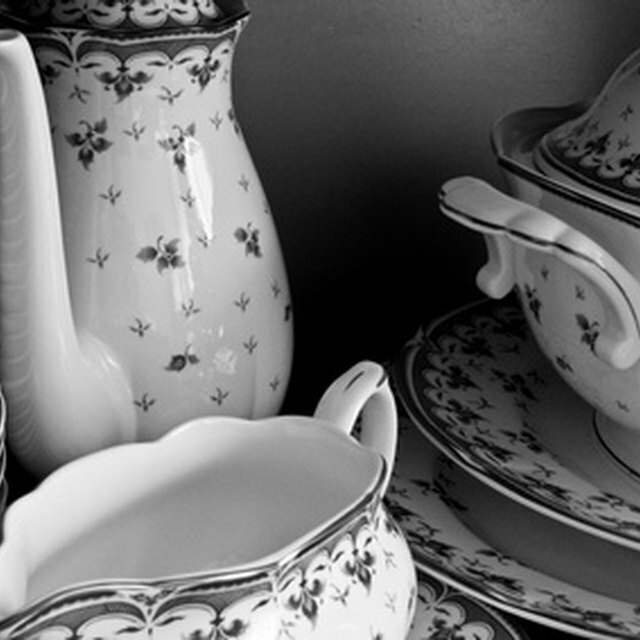 "The History of Royal Standard Bone China." Synonym, https://classroom.synonym.com/the-history-of-royal-standard-bone-china-12080736.html. 29 September 2017.